Making a visual impact is what designers and projectionist want to do. Apart from video content and graphics the chosen projection surface opens another door to creativity. We are used to perceive video content in a boxed and angled format – whenever something is outside this norm it catches our eye. Projecting onto uneven surfaces isn‘t easy as the shooting angle creates distortions and bends the picture. This is why projectionists need tools to put every pixel in it‘s correct position. And the more projectors come into play the more complex this work will be. Panasonic Geometry Manager Pro software is offering several levels to cope with increasing complexity. Panasonic Higher end DLP projectors are all equipped with a built-in Geometric Adjustment feature which expands projection capability onto spherical, cylindrical and other specially shaped screens. This allows very simple adjustments from the remote control. 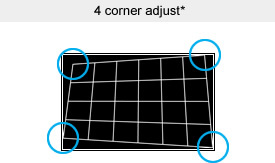 Each corner can be independently adjusted, and up to three sets of adjusted data can be stored. You can keep the aspect on when correcting curves. To make effective use of the screen area, you can also turn the aspect-keeping function off. On-board geometric adjustment with IR remote are providing full control on basic geometric setting such as stacking, projecting from an angle (keystone) and lightly curved screens. Doing complex installations with multiple projectors in edge blended and geometrically adjusted setup would be time consuming just with the remote. To massively cut setup time end reduce the installation work Panasonic is offering the Geometry Manager Pro software. This tool is designed to ease projecionists lifes offering full control on all setup related features organized in a structured way following the original workflow. You can Export / Import setting of adjustment data between units. Curved Screen & Multi Projection setup flow (example). For creating eyes catching effects or stunning indoor or outdoor 3D mapping, Panasonic is providing an advance upgrade kit to the Geometry Manager Pro. The optional upgrade kit (ET-UK20) can be used to expand the correctable range. It supports color matching, edge blending, custom masking (line masking or bitmap masking), uniformity correction, and other useful functions for multi-projector setups (max. 32 units). 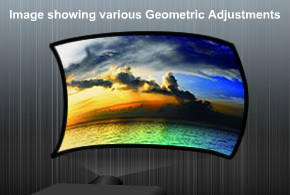 Its flexible and complex projection capability suits a wide variety of screen shapes. You can make the projector more flexible by upgrading the software. The ET-UK20 upgrade kit lets you maximize the projector's performance by minimizing set-up time and costs. By applying the Auto Screen Adjustment function to Geometry Manager Pro software, you can greatly save installation time and costs. You can also set up multiple projectors automatically and simultaneously to save time and expense. 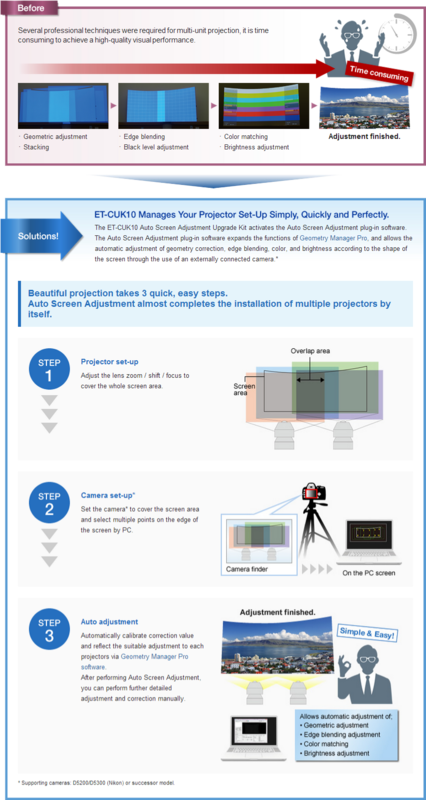 Simple and easy adjustment for multi-screen projection or curved-screen projection. *1 Supporting cameras: D5200/D5300 (Nikon) or successor model. 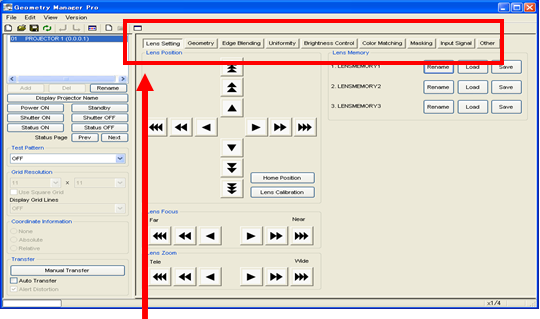 *2 The Auto Screen Adjustment Upgrade Kit (ET-CUK10) works as an upgraded function of the Geometry Manager Pro software. To use ET-CUK10, updates of projector firmware and Geometry Manager Pro software are required. The Geometry Manager Pro software is included in the optional ET-UK20 upgrade kit. The PT-DZ10K is not compatible with ET-UK20. Available for various screen shapes, such as flat, convex, concave, portrait and S-shape. 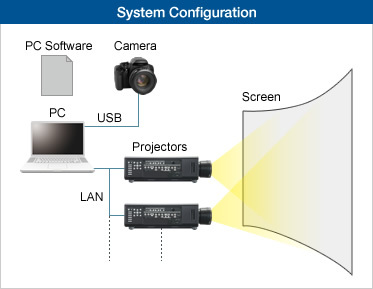 By connecting a PC to the projectors through a Hub network, and a camera* via a USB cable, the Auto Screen Adjustment plug-in software can measure the required adjustment using the connected camera,* and then overwrite the connected projectors with correction values, which makes system installation easier and more efficient. Calibration and adjustment based on the projector’s internal image processor achieves minimal image degradation. The color, brightness, black level, uniformity and alignment of several projectors can be measured. * Supporting cameras: D5200/D5300 (Nikon) or successor model. Panasonic continuously includes the latest features. Once you have registered the projector and activated the upgrade kit via the PASS system, you can enjoy all the functions of Panasonic professional projectors. * For more details on the latest projector and software information, please visit the above website.